Brightens, tones and hydrates blonde, grey and highlighted hair. WHO IT BENEFITS: .. SO Cool Shampoo tones blonde, grey and highlighted hair to ensure unwanted yellow tones or brassi.. Salon Only SO Essential Quad Gift Pack contains: Salon Only SO Essential Daily Sha..
Brightens, tones and hydrates blonde, grey and highlighted hair. WHO IT BENEFITS:..
Restructures & nourishes dry damaged & coloured hair. WHO IT BENEF.. Gentle weightless shampoo for all hair types. WHO IT BENEFITS ..
Scalp therapy to relieve and soothe an irritated scalp. WHO IT B.. Deep cleansing to detox and remove oil, minerals and build-up. .. 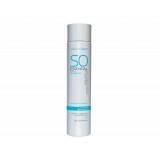 SO Blonde Quad Pack: to brighten, tone and hydrate blonde, grey and highlighted hair. ..